When I moved to Denver Mexican food was so far off my radar that I’m not sure I had ever had any. Well, maybe except guacamole. My mom came back from a trip to Mexico when we were kids and she shared it with us and though I turned my nose up for a couple of years, once I gave in and tried it I was smitten. My uncle had even visited Mexico and married while there but I don’t ever remember eating the foods prepared by my Aunt Maria…boy was that a mistake. North Carolina was equally devoid of all things Mexican but things changed dramatically when we moved to Denver, home of a great deal of Mexican influence. That being said, I don’t frequent the small restaurants hidden in off the way places in Denver proper and most of my Mexican here is still limited to restaurants I have to admit are more chain-like in nature so I am always delighted when I discover someplace new that stands out for their authenticity and last week I discovered a place new to me that is only ten minutes away…I think I’m in heaven! I had spent over a week sick with a miserable cold and felt good enough last weekend to venture out for a bit and wanted to give myself a break from the nonstop leftovers I had been surviving on. I had planned to order something ‘to go’ from Ariana’s but once I got there and the crowd hadn’t started streaming in yet after the Broncos game I decided to take a seat and enjoy my food on premises. So glad I did; the waitresses were so sweet; one even sat with me and we chatted a bit before more people showed up! As for the menu? I have to admit I’m a creature of habit; if there are Chile Rellenos on the menu, I’ll probably order them. If they’re good I may never try anything else; I just love the combination of creamy, perfectly spicy and crunchy all in one dish. I posted this photo on Instagram and was asked for the recipe. Of course I could try to recreate it but the truth is I knew I would not. Maybe one thing I love about having this dish out is that I am NOT cleaning up a fryer after cooking the crispy relleno! So I decided to punt and try something else and this soup was the result of that effort. I think it covers the flavors fantastically. 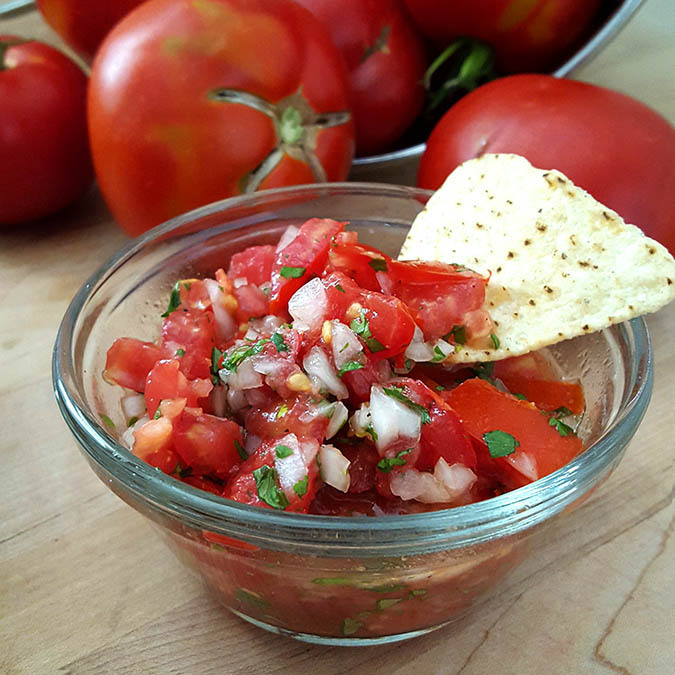 With a bounty of fresh tomatoes on the counter and just enough cilantro left on the one plant I had in my garden, I fashioned a simple salsa (See Notes). 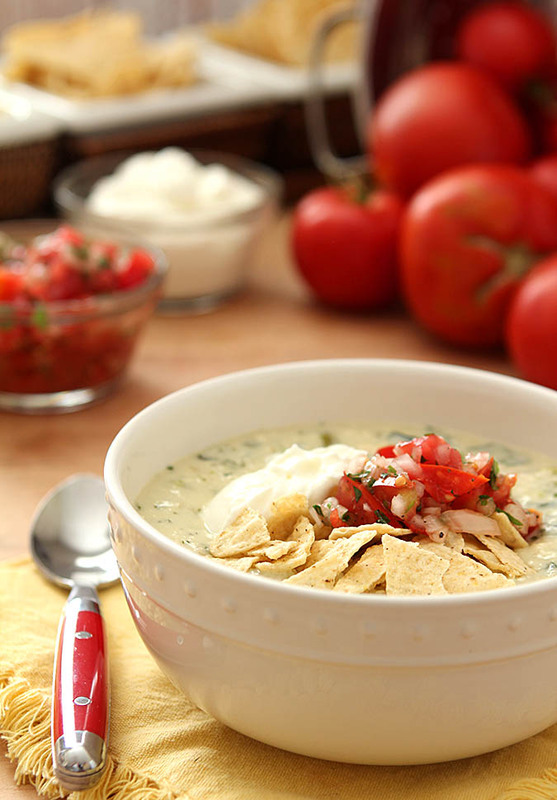 Creamy soup made with queso fresco cheese and roasted poblanos is rich and wonderful and the addition of the salsa, sour cream and crumbled tortilla chips for garnish brought in brightness and crunch that is part of what I loved from Ariana’s Chile Rellenos. Maybe this is one big reason I REALLY wanted a gas stove with my new home? 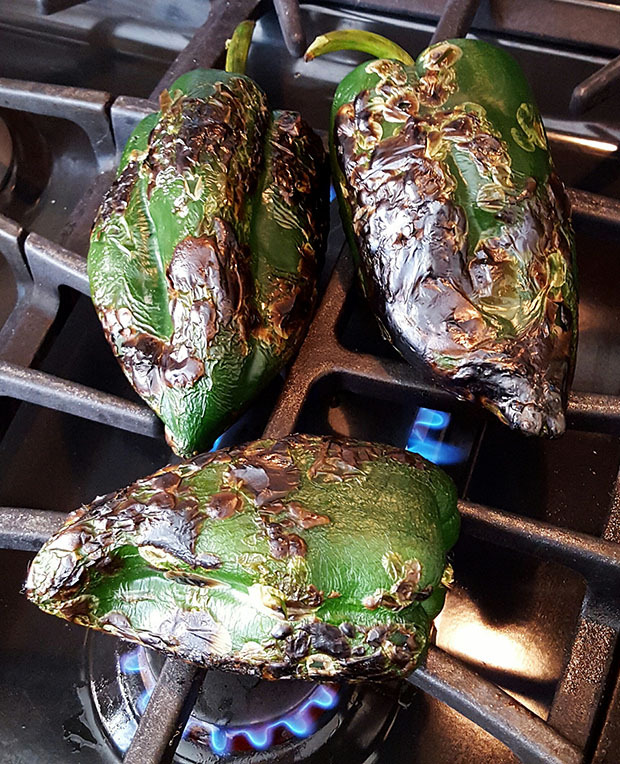 Sure doesn’t hurt…although this time of year there are vendors everywhere with roasted Hatch chiles for sale, doing the same with Poblano Peppers require roasting at home and I love the results from cooking them over my burners. No gas stove? No problem, they do just as well under the broiler. When I first made this Chile Relleno Soup I had the notion of putting some additional cheese on top and melting it under the broiler but the truth is it just didn’t need it. It’s thick enough that the toppings didn’t sink to the bottom; I think that’s why I had thought a layer of melted cheese would be good and I’m so glad I tried it without first; any more ingredients would have been overkill; it’s rich enough just the way it is. Can I just tell you without bragging how amazing this soup is? 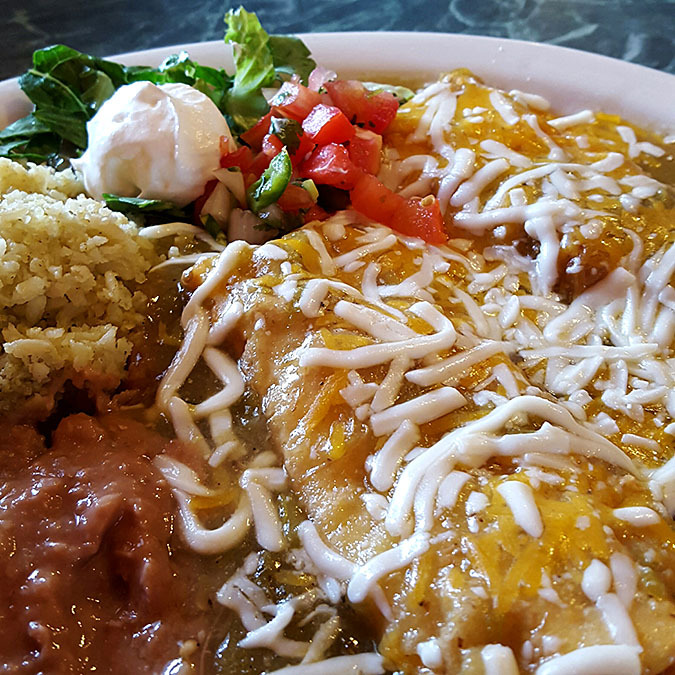 It hit all the right notes and while obviously not ‘a’ Chile Relleno, both the flavor components and the rich mouthfeel all served to offer up a rendition that is more than adequate if craving that taste and wanting to serve something at home. I had considered frying some tortilla strips for the garnish but as I finished I realized that without that step that this soup was really pretty easy and doable so opted for good tortilla chips from the grocery instead. That was a good call; cleaning up a fryer for a few crispy tortillas really was not warranted. 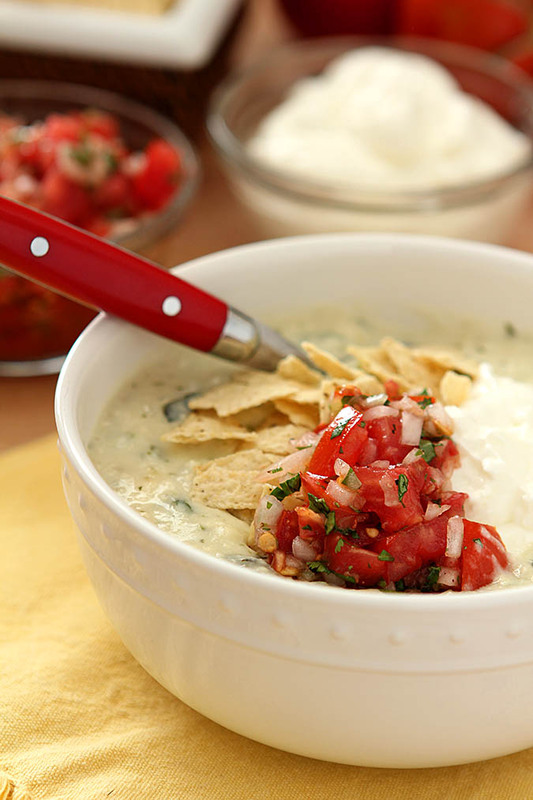 If you love Chile Rellenos like I do you must try this soup; it’s so good I squirreled the leftovers away back in the far reaches of the fridge. They’re mine, ALL mine!! 6 oz Queso Fresca cheese, crumbled. Clean and dry the poblano peppers. Places them on gas burners or on a cookie sheet covered in foil. Roast for 5 minutes on each side either on the burners or on the cookies sheet placed under the broiler. Roast until skin has blackened. Remove from the oven and place the chiles in a plastic bag and seal. Set aside to cool. Melt the butter and olive oil in a large pan over medium heat and saute the onions and jalapeno until softened. Add the garlic and cilantro and cook for about 2 minutes. Add the flour to the vegetable mixture and cook for 2 minutes on low, then add the chicken broth, half and half and the salt and pepper. Simmer on low heat. Once the chiles have cooled, remove them from the plastic bag. Scrape the chiles under cold running water with a knife to remove all of the blackened skin. Cut off the stem and cut in half to remove the seeds. Chop the chiles into medium size pieces and add them to the soup along with the crumbled queso fresco cheese; simmer on low for an additional 15-20 minutes. To serve, top with crumbled tortilla chips, sour cream and salsa. I added the Queso Fresco cheese with the chopped Poblano Peppers and knew it would not entirely melt; leaving little pillows of cheese in the mix. If you prefer your soup be creamier, add the cheese prior to the poblanos and blend the mixture with an immersion blender first. Add all ingredients to bowl, mix and let sit in fridge for at least 15 minutes. This post is this weeks edition of The Food Network’s #FallFest featuring soups. For more fall soup ideas, be sure to visit my friend’s sites too! Oh my goodness!! This looks amazing!! Delicious!! I made this tonight and we all loved it!! I’ll be making this again … Yum! 🙂 thank you for a delicious and easy recipe!! We have one place we can get tacos. It has benches and it’s in a shopping center. That’s it. I’m dying to make your soup. I can tell by the photos that you weren’t kidding about how good it is. I’m glad you’re better! I don’t do much Mexican at home but a friend just made some tacos that were amazing and this was too…so maybe that needs to change? I know that now I would miss it; the longer I’m here the spicier I like it! This looks so amazing! I just finished cleaning my 2 bushels of roasted green chiles last week. Hope they get them through the winter Ü Can’t wait to make your soup this weekend. You’re in Denver? Gotta make a jog up to Brighton and visit the Tortilleria Chihuahua. I will never buy store bought tortillas (corn or flour) ever again. These are made on premises daily and contain no preservatives. I make a tortilla run once a month and freeze what I don’t use. Can’t WAIT to try them with this soup….yum!!! Thanks for sharing!! I’m in Castle Rock now; probably closer to the Springs than Brighton sadly. I have friends who get homemade tamales up that way too…now I am dying for some! The tortillas I do buy are in Costco; they’re fresh and have to be cooked so certainly better than most I’ve bought at the grocery store but I’ll put this on my ‘places to get to’ list…thanks Tracy! That looks amazing…can’t wait to try it in the Fall! Thanks for sharing.